There was news last week involving a dog and her blind master. The dog was leading her master to the Holland Village’s Haagen-Dazs but a staff stopped them saying that dogs are not allowed inside, and then led them to the seating area outside. The staff did not recognize that it was a guide dog. The management is doing its best to keep this from happening again. The staffs of establishments should be aware of guide dogs. Guide dogs are part of a blind person’s life. The basic role of guide dogs is to help their masters get around. But the dogs should be trained, and conditioning it will depend on the environment of the blind. In details, how do guide dogs help their blind masters? 1. Direct Route – When given an instruction by its handler or master, guide dogs should follow a direct route. This means that the dog should ignore all the distractions like the smell. 2. Steady Speed – The dog should maintain a steady speed. The dog is usually at the left of the handler. The dog should be ahead. 3. Stop Until Told to Continue – If a blind person wants to stop, the dog should stop too. The dog is trained to wait for the handler’s instructions. 4. Navigation – Guide dogs can navigate. They can turn right, left, backwards, forward and stop depending on the command. 5. Avoid Obstacles – Since handlers or the blind cannot see obstacles, it is the dog’s responsibility to avoid it. 6. Board Public Transportation – Guide dogs can also help the blind with transportation. The dogs will help the blind move around the bus, train or any other public transportation. 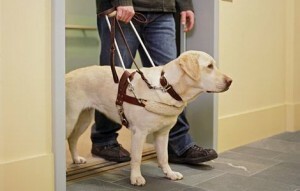 When the blind needs to go to the elevator, the dog will bring him/her there.